It’s a busy primary day in Riverhead Thursday, as two elected officials go toe-to-toe for the Republican supervisor ticket, Town Board candidates — all retired cops — fight over two open slots and three candidates compete for party nominations for Town Justice. Riverhead Town Board members all agreed on a 12-year term limit for elected officials in policy making positions during a discussion at Thursday’s work session. The job of Town Council member is described as part-time, but it takes hard work and dedication for candidates to make good on those oft-repeated campaign promises to keep the town’s taxes in check while “preserving our way of life.” It takes not only time but also guts and the ability to learn all the technical aspects of what makes town government work — in order to help it work better. Jodi Giglio and Millie Thomas have just the type of skills to be highly effective Town Council people. Ms. Giglio, a Republican incumbent, already has four years’ experience under her belt and has proven her ability to understand the inner workings of town government. She’s also helped keep fellow GOP member and political rival Supervisor Sean Walter in check — especially in voting against Mr. Walter’s plan to hire his own political adviser, Anthony Coates, for a made-up job in 2012. In addition, she has spearheaded an attempt to lure the Federal Aviation Administration to the town’s EPCAL site, despite pushback from the supervisor. But as she made clear in her first run in 2009, Ms. Giglio is “business- friendly.” By trade, she is a permit expediter for developers. This could prove beneficial when it comes to recognizing when developers are trying to play the town. But when developers do exactly that — and they have; one has only to look to the Costco site along Route 58 for a recent example — one can’t help but wonder: Where was Jodi? But she makes no apologies about land-use rights, to the point that it’s hard to even imagine her as someone who will truly fight to make sure developers give back to the town just as much as they take from it. Enter Ms. Thomas. Her résumé, like Ms. Giglio’s, includes “business owner,” but her civic involvement and the priorities of the town’s Democratic slate in general — neighborhood preservation through strict adherence to the town code — may serve to counterbalance Ms. Giglio’s business-friendly approach. Ms. Thomas’ ability to navigate one of the worst economic downturns in the real estate market while maintaining her business, Landmark Realty, is impressive. A former president of the Long Island Board of Realtors, she said at a debate co-sponsored by the News-Review that her firm handled $27 million worth of sales last year, ranking in the top 10 percent in Suffolk County. It’s a shame Ms. Thomas wasn’t more vocal in touting her achievements out on the campaign trail. Unlike her fellow candidates, she failed to start a campaign fund or raise any money. While many politicians often say they’re “not a politician,” to explain away what would appear to be a lack of true dedication, with Ms. Thomas, it’s believable. Aside from her business, she’s been involved in numerous charitable endeavors, taught religious classes for a dozen years through St. Anthony’s Church in Rocky Point and has dedicated time and knowledge to the Long Island Board of Realtors, serving it as director, secretary and vice president. No one could ever accuse her of being lazy. Given her track record, there’s no reason to believe she wouldn’t bring the requisite level of dedication to improving town government. As for Republican incumbent John Dunleavy, he should be credited for his public service to the town as a police offer and for eight years as a councilman. But he’s been too comfortable for too long maintaining a superficial knowledge of how the town works. He’s too apt to take people coming to the Town Board at their word, without the appropriate level of skepticism and research. Even if Mr. Dunleavy can’t read site plans, he can read the newspaper. His job as a Town Board member is to stay on top of issues for his constituents, and maintaining a thorough base of knowledge about issues of such importance reigns paramount. We think it’s time he moves on. Back on the Democratic side of the ticket, council candidate Bill Bianchi would bring 22 years’ experience as a state assemblyman to Town Hall, but he’s been unable to articulate in any detail his accomplishments in state office or exactly how that experience would translate into his Town Council work. He has said he knows how to work across party lines, but it seems that fighting within political parties poses more of a challenge for Riverhead. Mr. Bianchi’s experience in Albany, we imagine, could prove useful as the town continues to work with the state on the effort to redevelop the EPCAL land — but, so far, Mr. Walter, state Senator Ken LaValle and Assemblyman Fred Thiele seem to be moving along just fine. Introducing a new personality coming out of Town Hall could disrupt that chemistry. 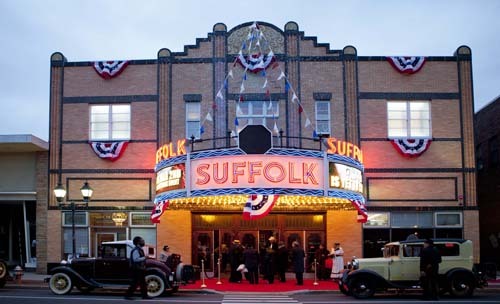 KATHARINE SCHROEDER FILE PHOTO | The Suffolk Theater’s grand re-opening night in February. The first of two town political debates being sponsored by local media and held at the historic Suffolk Theater will see two Democratic primary supervisor candidates square off, followed by three Republican primary hopefuls for town council. The debate, sponsored by Riverhead News-Review and RiverheadLOCAL.com, will start at 7 p.m. this coming Monday, Aug. 26. Doors open at 5 p.m. There will be a suggested $5 donation at the door, with all proceeds going to Brendan House, New Beginnings. Both debates will be moderated by Mr. Parpan, RiverheadLOCAL editor and publisher Denise Civiletti and News-Review editor Michael White. The Democratic candidates will debate first, for about 45 to 50 minutes, followed by the Republican candidates. Those arriving early for the second debate may be asked to wait in the theater’s lobby area, as to not disturb the first round of candidates. All questions for the debates have been prepared in advance, and were written by readers as well as the moderators. All candidates will be given time to make closing statements. No outside video recording of the event is allowed. The theater’s bar and restaurant will be open at that time, but shut down during the debates, which are scheduled to run until 9 p.m. The theater’s bar and restaurant will re-open after 9 p.m.
PAUL SQUIRE PHOTO | Richard Wines, chairman of the Landmarks Preservation Commission, motions toward The Riverhead Project restaurant in the downtown historic district. Local government officials and business owners unveiled signage along Riverhead’s East Main Street Tuesday morning to mark the newly-recognized downtown historic district, which was added to the National Register last month. Four Town Council members, downtown Business Improvement District president Ray Pickersgill, The Riverhead Project restaurant owner Dennis McDermott and members of the town’s Landmarks Preservation Commission gathered outside the restaurant to praise the work of the commission in getting the coveted designation for downtown businesses. The area along East Main Street was added to the National Registry in August, and is now eligible for tax credits. Twenty signs, paid for by the Riverhead BID, will be posted along the streets, officials said. The first sign was posted near the building housing The Riverhead Project on East Main Street. The mid-century modern building was built in 1962 and was home to several banks until it was converted into a restaurant in 2011. A brief moment of silence was held before the ceremony to honor all of those, including office workers, police officers, firefighters, first responders and their families, affected by the Sept. 11 terrorist attacks that occurred 11 years ago.